"It was mind boggling! We couldn't do the entire thing on live music because this show was being telecast live and there was no scope for error in sound; nonetheless, it was incredible! In the heart of Trafalgar Square, there were about 15,000 people including goras. This was the first time that such an event was held. The reaction that people gave me and to the whole event was overwhelming. The whole atmosphere was positive. In spite of the bomb scare in June, the people were warm and inviting. I believe that such events are very important for Pakistan. 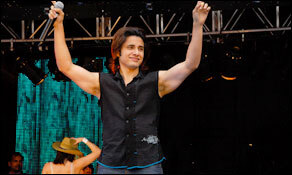 As for being a musician is concerned, I think that doing shows abroad is equally important as doing shows in Pakistan. All over the world, celebrities are used to promote culture and create the image of a country. Pakistan's image is suffering, especially in the Western world. What else can we do? But when an event like the Lux Style Awards is held in Malaysia, a show of this scale is held in London and artistes from Pakistan go abroad, it really does make a difference. One thing that I can say for sure after this trip to London is that people want to connect, they want to listen and learn and it is through these events that they can do so." The Channo boy has a huge fan following in the UK. And always smiling, he never disappoints his fans. "It had been a while since I had performed in the UK. I was performing there after 7-8 months and I love performing there so it was fabulous. We couldn't do live music because the show was going live and there wasn't any room for sound hiccups but people still enjoyed it. There were about 15000 people there and it was just so great! It wasn't just musicians but fashion designers and movie stars and fashion models so it was definitely a great way to mark 60 years of our independence. The people were so great and it was all positive and I just had a great time!" Annie was a huge hit with the crowd. She may not be the most refined of singers but she is most definitely an entertainer who packs a punch. With great body language and infectious energy, the crowd responded to her. The hip-hop vibe that she exudes went down well with the desi boys and girls. The dancers who accompanied her are students from a dance school in London. The Pakistan Day Parade goes beyond celebrating the country we love. Now there are Brits who will tell their mates "We danced with a Pakistani pop star at Trafalgar Square!" Hadiqa has turned into a complete risk taker. She was the only performer to sing totally live that day, no back track, she insisted that the band play behind her. With a gazzillion hits under her belt, she opted to release an edgy English album with guitar whiz Aamir Zaki. And after the brave decision that she took to sing live at the Pakistan Day Parade, it's clear that she's sick and tired of taking the easy way out. For an accomplished pro like her, that's just plain boring. Her brother and manager Irfan Kiani helped Shahi out a lot in Lahore when he flew there to do the national songs medley for the finale. He gathered everyone at the studio so it could be done. "Performing in London is always a delight. I have been performing there for the last 12 years to massive crowds at places like Wembley Arena. But this particular event stands out. It was something different that included a lot of people. It wasn't just music but other mediums of arts that were put forward and that was very exciting. People were dancing and cheering us on and there were thousands of people. This event is important and will help project a softer image of Pakistan. Goras were dancing to our tunes! Inspite of all the elements that have made Pakistan one of the most controversial nations, the response we got was really positive. There was no skepticism towards us, nothing of that sort. Often the media has a vested interest. And they tend to exaggerate at times. I met Tony Blair and he said to me, "I like Pakistanis for two reasons. One is their philanthropic nature and the other is their strong value system." 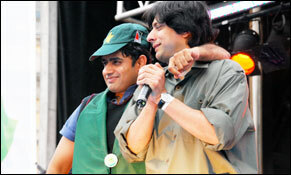 Abrar and Jawad performed together for the first time on Trafalgar Square in the final medley. "I wanted them to sing 'Main Bhi Pakistan Hoon, Tu Bhi Pakistan Hai'," says Fifi Haroon. "It would be symbolic, the two bhangra kings of Pakistan together. People kept on telling me that that was never going to happen, but I asked them and they both agreed." Abrar and Jawad gave London a moment to remember. Girl power: Maliha Lodhi has won the minds of statesmen around the world while Nadia Khan has won the hearts of Pakistanis everywhere. So much so that at Trafalgar Square a lady came up to her with a pot full of biryani. "Beta, you said on your show that you liked biryani, so I cooked some for you," she said to Nadia. That's true love, Pakistan style! Jahangir Khan was a part of Pakistan Day Parade. Legendary squash player, there has been none like him since. He remains one of the few icons young Pakistanis continue to look up to. 21-year-old Amir Khan is one of the hottest boxers in the UK. Of Pakistani origin, he is the youngest boxer in Britain since 1976. Like all great sportsmen, his fan following nullifies all divides. Najam Shiraz performed Allan Faqir's classic song 'Itne Bade Jeevan Saagar Mein'. He has the vocal range to carry it of.